PA organizations call on "rebels" in Judea and Samaria to escalate fight against Israel in response to the "crimes of the occupation." 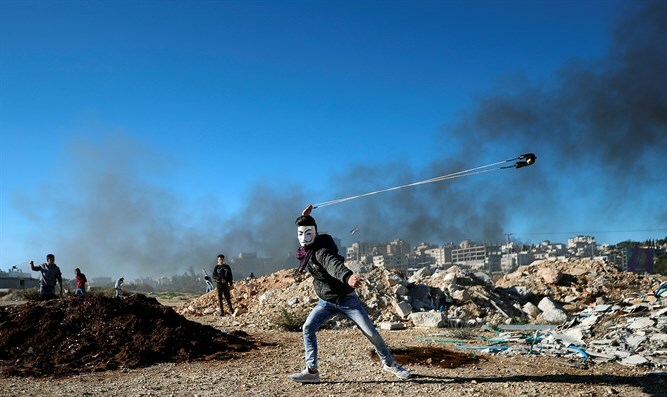 The Palestinian Arab terrorist organizations on Thursday called on the "rebels" in the "occupied West Bank" to respond to the "crimes of occupation" against the Palestinian people. "The cold-blooded execution of the 16-year-old martyr Samah Mubarak is a heinous crime, in addition to the crimes of the occupation soldiers against our helpless people," the organizations said in a statement published on Hamas’ Al-Resala website, in a reference to the female Arab terrorist who was killed by security forces on Wednesday as she attempted to stab security officers east of Jerusalem. The organizations added that the escalation of the intifada on all fronts is the only way out of the occupation. They also called on the Palestinian Authority to cancel the security coordination with Israel and to fulfill its goal of "cutting off the hands of the Zionist thieves." The Palestinian Arab organizations noted that the establishment of a new Palestinian government without national consensus would deepen the rift in the internal Palestinian arena, since this government does not represent the Palestinian people but only the Fatah movement.